Check out these tech trends and learn about whole-house audio, home theaters, energy monitoring and more! Looking to spice up your home with technology? Then check out these top nine tech trends from Matt Carter, a South Carolina-based consultant and electronic systems contractor who does outreach for trade organization Custom Electronic Design & Installation Association (CEDIA). What is an electronic systems contractor, or ESC, you ask? An ESC is an individual or company specially trained to provide design, integration, installation and field maintenance of low-voltage electronic systems for the home. These technicians can help you do a variety of things, from setting up a house-wide wi-fi network, to installing a home theater, to creating a comprehensive system that allows a homeowner to monitor energy consumption, control lighting, heating, cooling, security and other systems from a single integrated touchscreen. Integration offers many conveniences, but it can also create a whole new experience. Today, complex house systems are being integrated, allowing a homeowner to access lights, heating, security and other systems with a single touchscreen. In this project the 10 subsystems, including each room’s audio, video, security, lighting, HVAC, cameras and gate access, have been integrated. 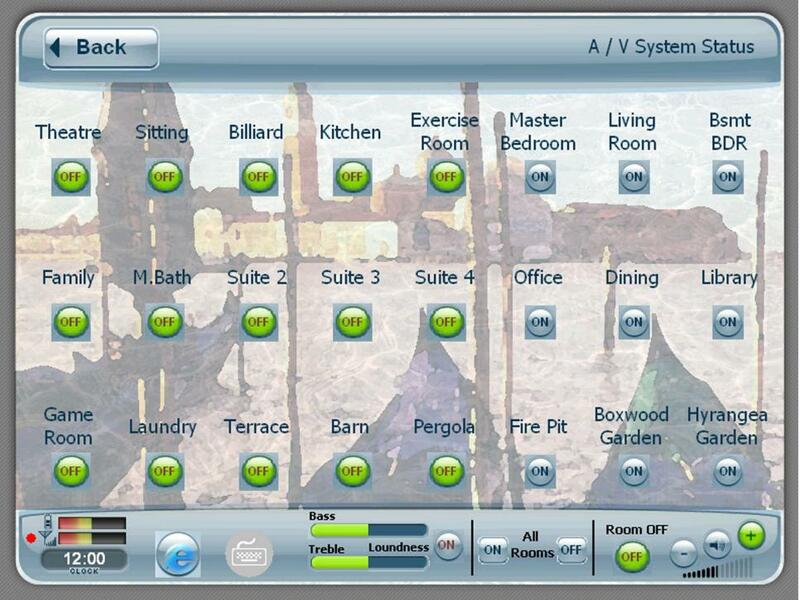 This allows the client to control them from 21 different user interfaces throughout the home. 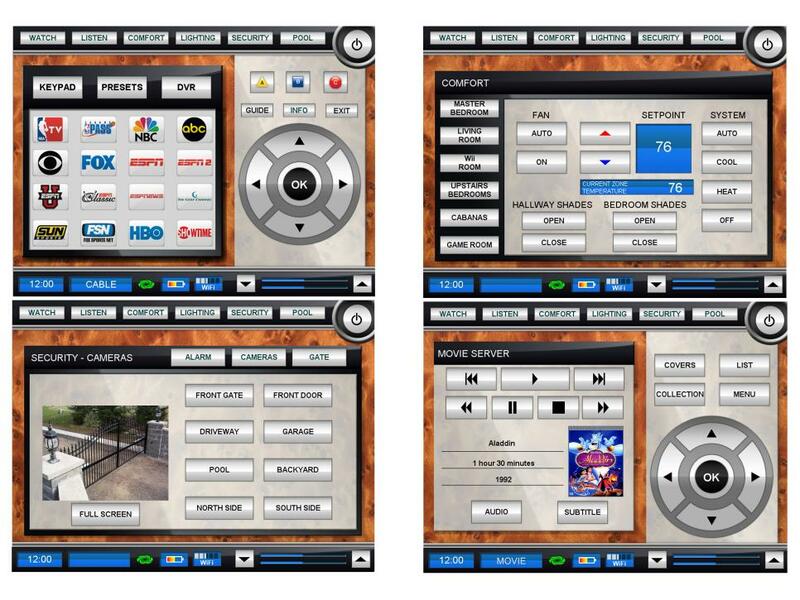 From any touchscreen, the client can control nearly anything, whether they want to start a movie in the theater, view the gate camera, activate the gate to open for guests or warm up the hot tub. Image Source: Architectural Electronics, Winter Park, Fla. Remember when having a big-screen TV meant having it dominate the room whether it was on or not? Today, even large televisions can be installed so they can go unnoticed when not in use. In this project, the client wanted to be able to watch the late-night news or a movie in bed, but didn’t want to see the plasma screen all day, every day. 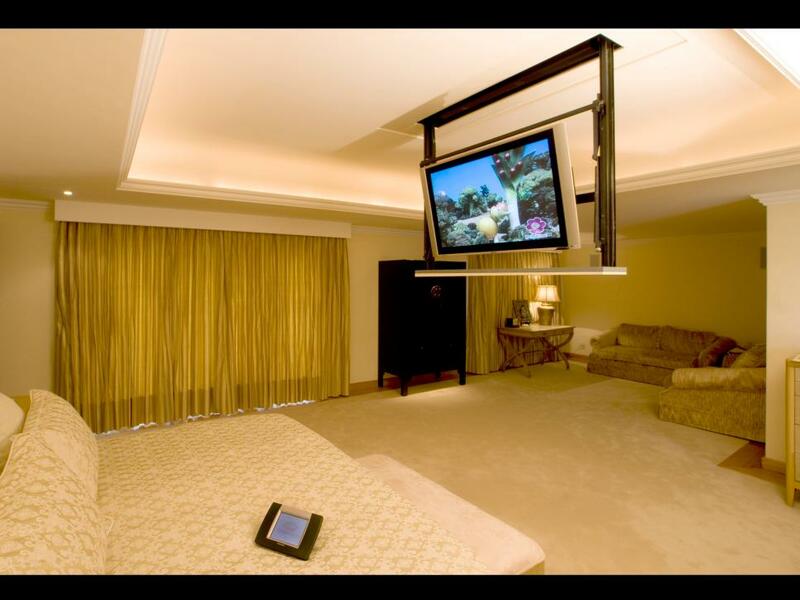 NTX used a pop-up ceiling lift that stows the 42-inch plasma display into the ceiling when not in use. Speakers were installed in the wall, and they’re barely noticeable. Audio and video equipment, housed in an electronics closet, can be controlled through a touchscreen. (Image Source: NTX SA de CV, Naucalpan, Estado de Mexico, Mexico). The advent of the universal remote meant no more juggling several controllers when switching from watching television to starting a movie to playing video games. Plus, it meant getting rid of that pile of remotes scattered on the coffee table. 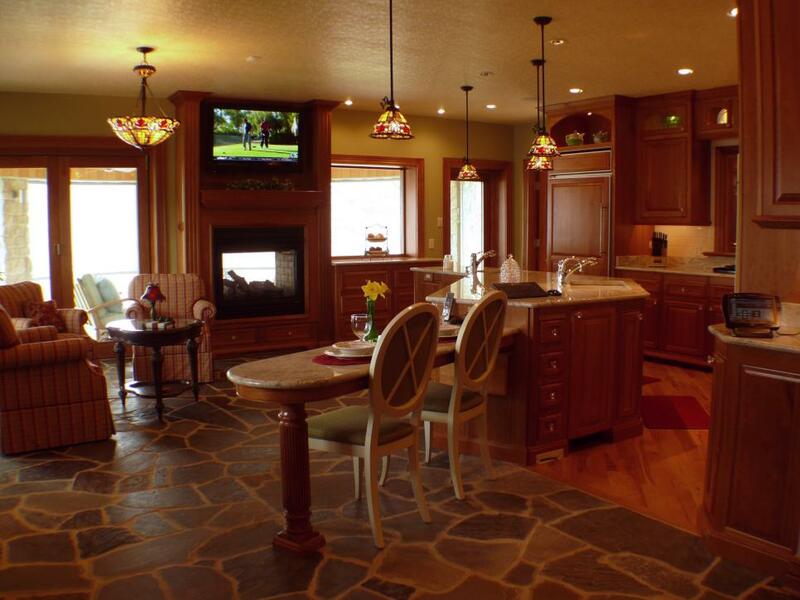 In the project shown here, the clients turned to Springfield Central Systems to create an integrated home that offered both simplicity and functionality. The technicians were able to create something that would be easy to operate not only for the clients, but also the many houseguests they expected — who probably wouldn’t be as familiar with some of the home’s amenities. Image Source: Springfield Central Systems, Springfield, Mo. The house also includes a power management system that eliminates the use of standby power, which is said to account for some 5 percent of total US power consumption. With this system, “off” really means off. The system can also conserve energy by shutting down the refrigerator for brief periods, reducing consumption without letting food spoil. What would happen if you could see how much energy you were using throughout the day? In the project shown here, SoundVision created feedback systems that study — in real time — how daily habits affect the home’s energy consumption. 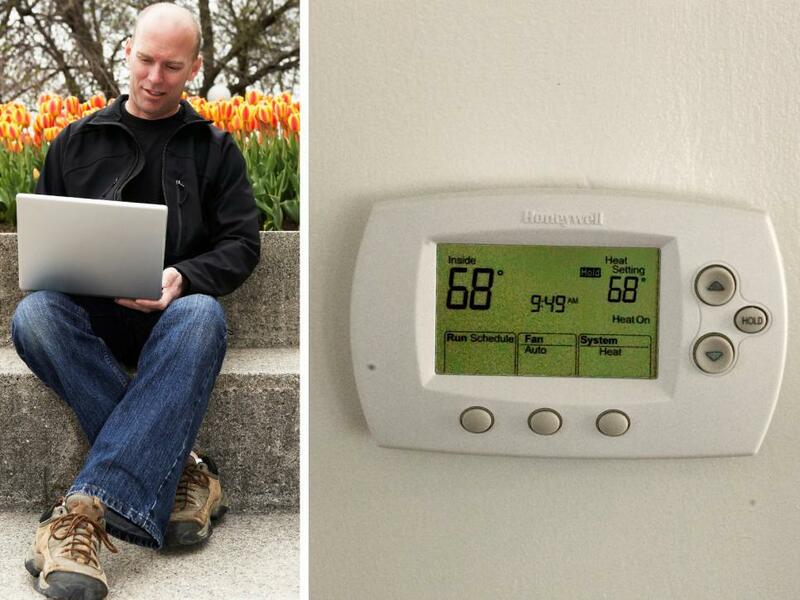 The house integrates renewable energy, energy conservation and home resource monitoring. 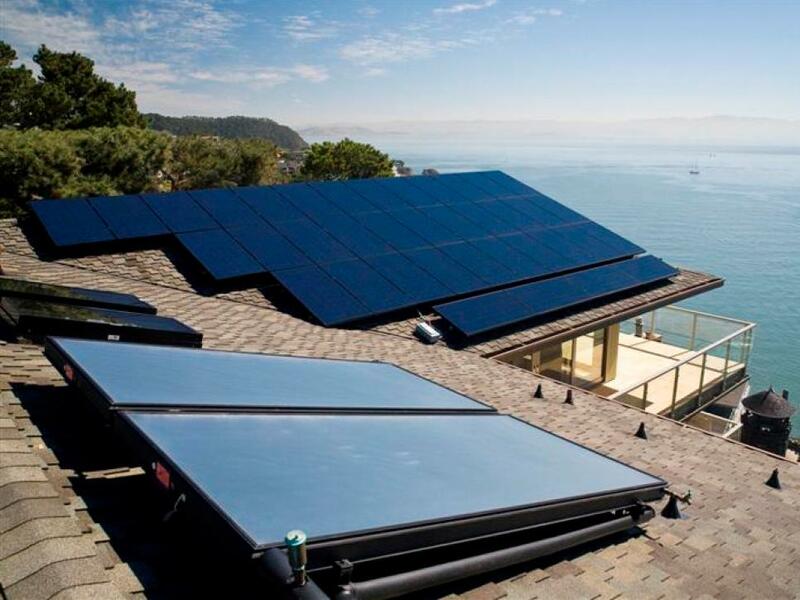 A 12-kilowat photovoltaic system is the home’s primary source of energy; it feeds electricity back to the local power grid during peak generation periods. It also uses a timer so that the hot water heater isn’t busy heating water in the middle of the night when it isn’t needed. Image Source: SoundVision, Novato, Calif. Homeowners are using technology to create entertainment rooms with superb sound and video quality plus a high-end design aesthetic. These rooms make great home theaters, but they also work just as well for cocktail gatherings. 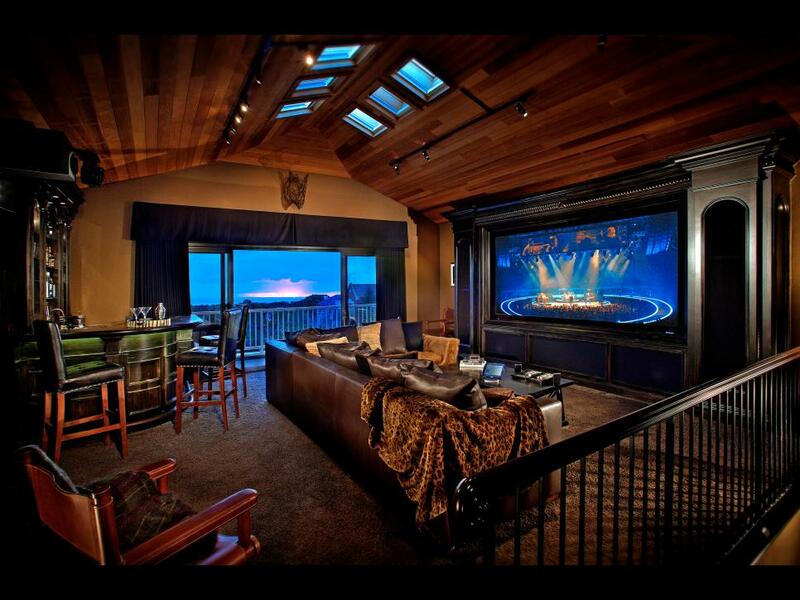 In the project seen here, Genesis Audio & Video turned an unused shell above a garage into a multifunctional media room. The entertainment systems were designed with all the room’s potential uses in mind; it includes a sit-down and walk-around bar, seating for up to a dozen people and access to an outdoor patio. 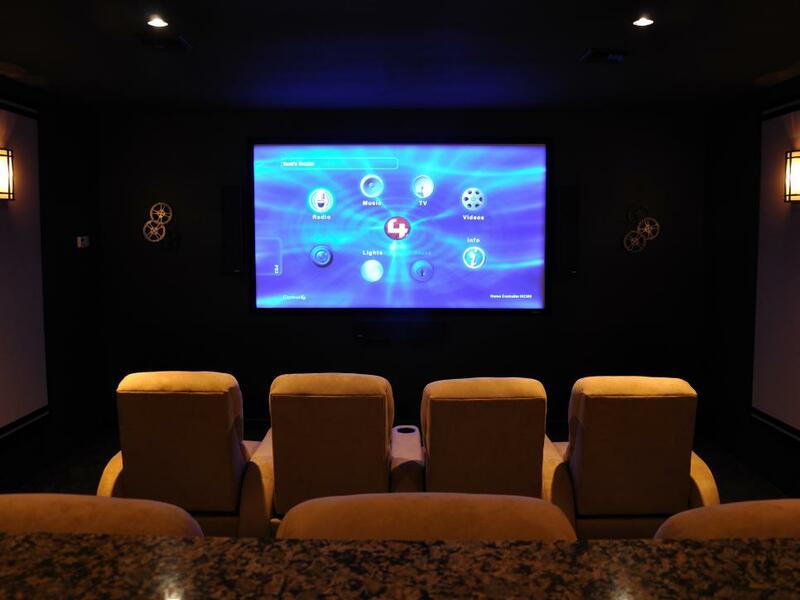 This media room includes access to the house-wide DVD and music server, in addition to the home’s security cameras, the Internet and house-wide lighting controls. Rather than hang the projector from a pole in the ceiling, technicians used a cantilevered wall mount to install it sleekly at the top of the rear wall. Cabinets were built to match the curve of the film screen, and the rear and side walls were given acoustic treatments to optimize the room’s sound quality. A wi-fi touchscreen enables the homeowner to automatically open and close the blackout drapes for the windows and sliding doors, along with the blackout shades for all six skylights. Image Source: Genesis Audio & Video, Irvine, Calif.
Gaming isn’t just for kids any more. In fact, some reports show as many as 25 percent of gamers are age 50 or older. As gaming becomes more interactive and immersive, homeowners are turning to technology to seamlessly incorporate that experience into a home media room. In the project shown here, the clients wanted a media room outfitted to create optimal experiences for gaming and watching sports. 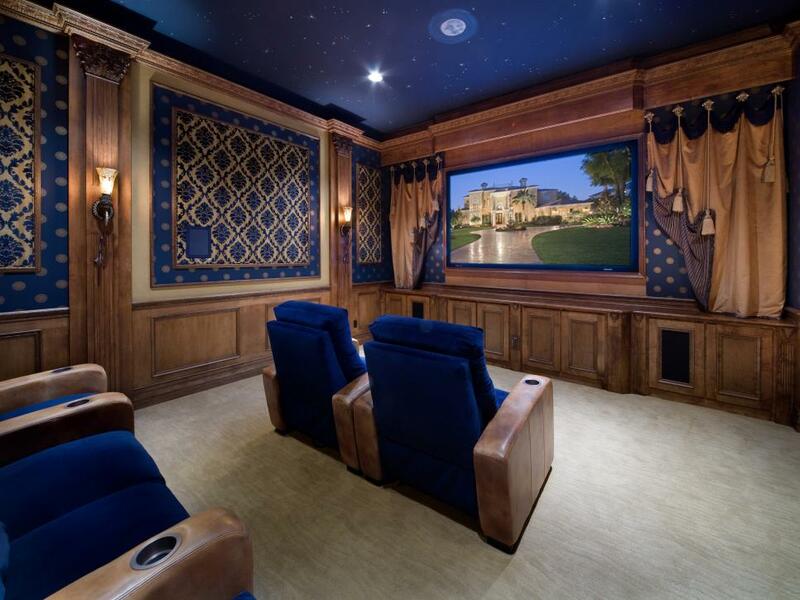 Schlabach Security & Sound helped turn an existing two-car garage into a room that feels like a theater without leaving the rest of the house thumping from what’s going on inside. The room includes a 106-inch screen and a system that offers remote control of lighting, movies, DVR and PS3 gaming system. The systems are wired for Internet access to accommodate online gaming. Image Source: Schlabach Security & Sound – Lecanto, Fla.
Consumers are increasingly turning to their mobile devices for email, social networking and access to everything from mapping to restaurant reviews. Demand for real-time information that can be accessed from anywhere is translating into the home. In the project shown here, Chesapeake Smart Homes created a fully integrated home system for a multi-building estate that the client could access from an iPhone or wireless touchscreen panels. With just a few buttons, the client can check the security cameras, adjust lighting or play music in several different zones throughout the property. Image Source: Chesapeake Smart Homes, Stevensville, Md.